This program provides support and treatment for patients with Diabetes. 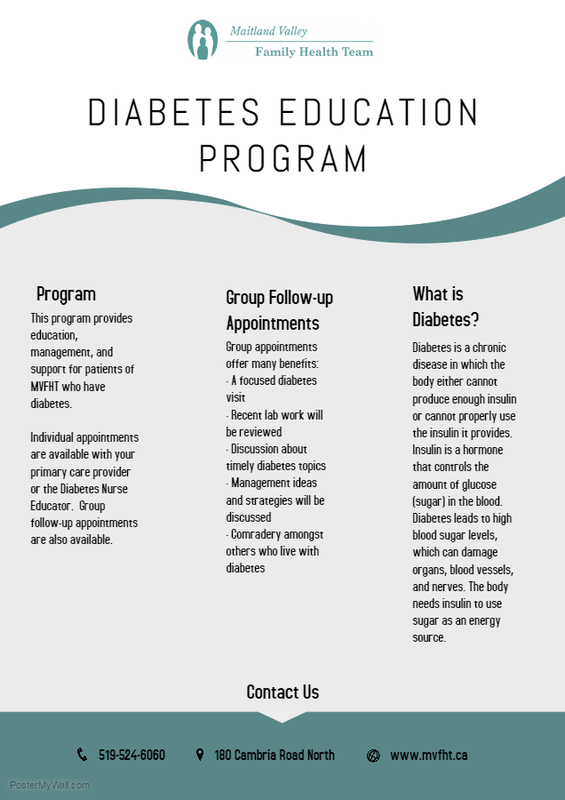 1) Individual appointments are available with your primary care provider or the Diabetes Nurse Educator. New participants will be asked to sign a confidentiality agreement. Bring your “Diabetes Passport” to the group follow-up appointment. Appointments must be booked in advance. It is not a drop-in service. Diabetes is a chronic disease in which the body either cannot produce enough insulin or cannot properly use the insulin it provides. Insulin is a hormone that controls the amount of glucose (sugar) in the blood. Diabetes leads to high blood sugar levels, which can damage organs, blood vessels, and nerves. The body needs insulin to use sugar as an energy source. Type 1 diabetes occurs when the immune system mistakenly attacks and kills the insulin releasing cells in the pancreas. As a result, sugar builds up in the blood instead of being used as energy. Type 2 diabetes occurs when the body cannot properly use the insulin that is produced or does not make enough insulin. As a result, sugar builds up in the blood instead of being used as energy. Click preview image below to veiw printable PDF.